Over the years, the Falls of Clyde have been an unhappy venue in some respects for the peregrine pair that breed there. The beautiful surroundings must have been inspiring to this most awesome of fliers however. The tercel (male) has raised 32 eyeasses (chicks) in his 15 years while his present partner is responsible for 21 over their time together, being merely a young lady at 11 years old. Peregrine falcons live up to 16 years and fly at 200 mph (that's 89 metres every second - Wow!). This means they have special one-way, cone-shaped nostrils to control air flow through the lungs at that breathtaking speed. The design is well proven enough to be copied by several jet engine designers! This year, the SWT (Scottish Wildlife Trust) confirm that eggs were laid and that they will be safe, considering the previous history when eggs were stolen and then replaced in the nest, to be successfully reared. 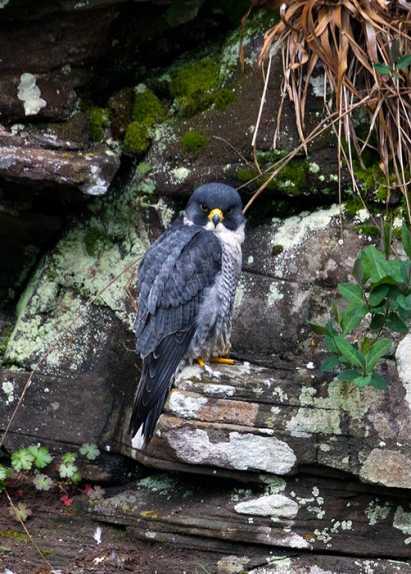 The Falls of Clyde Ranger, Laura Whitfield says, "For a 15th straight year, we have peregrine eggs at the Falls of Clyde. The birds have nested out of harm's way on a ledge in the gorge. We've had plenty of people up to the viewing site, just 60m away from the nest site on the other side of the gorge." 24-hour surveillance using more than a dozen people will ensure vandals (active in 1999) and other criminals will be quickly dealt with. Storms are less easy to deal with and last winter destroyed part of the viewing area, so popular with thousands of visitors; hence this blog. Elsewhere in the wildernesses of Scotland, the fish are a-quivering. Ospreys are famed fishermen and though not as fast as the quickest hunter on earth, they do perform an acrobatic alternative over the loch. Alternatively via this webcam, which shows the very famous Lady of the Loch and her mate (of whom we have written before) at home on the nest. NOTE: Scottish daylight hours, which are still quite short. Her 62nd egg in her 22 years creates more records throughout Europe, although her fans number so many now that she could break many more statisticians' hearts Aged and worn she may be, but if she hatches this one, nobody knows if she can return from Africa to lay again another year. It's best to enjoy this incredible individual while we can, in her favourite home at the Loch of the Lowes in Perthshire among those fine and famous Scottish hills.